This might just be for my benefit (apologies for that) but if you'd like to read the long long post, I decided to recap our wedding ceremony and how we decided on everything since usually this is one of the most easily forgotten parts of a wedding. More often than not, we all jump right into the reception, but forget the most important part of the wedding- the actual marriage ceremony. Have you ever noticed how when someone asked you about the wedding they never start with the vows, the music, the officials, etc. they ask about your colors, the food, the music, if there will be a bar... and I think that is kind of sad. Now don't get me wrong- I love love love the reception (if you can't tell by all of the boards, posts, etc) and I am not saying it's not important, but I thought I would share some memories from our ceremony that truly made the entire day even more perfect*. 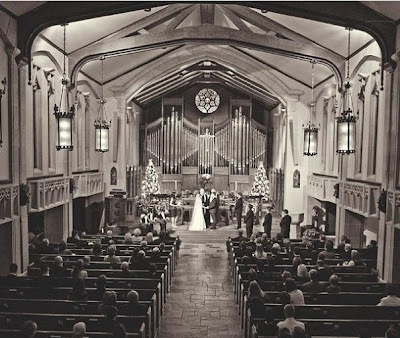 Choosing the church led to the second really meaningful part of the ceremony. 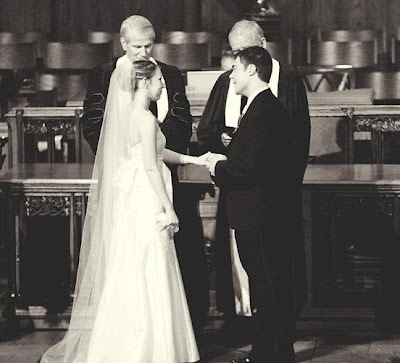 We would recite the same vows, read by the same pastor who had married my parents. (Dr. McCall also baptized my dad, my sister and me, and had always been a huge part of my life so there was no question he would be the one to marry us.) This led to a slight dilemma though- well more of a bump. Because Dr. McCall was retired, we had to have one of the pastors from my church present throughout the ceremony as well. I wasn't close at all to our church's new pastor (he was hired when I was away at college) but I loved our associate pastor so J and I asked him to be the other pastor present. So, yes, that meant we had two officiates at our ceremony- something you rarely see, but something we would never change. Boyd (Rev. Lien) was more of the free spirit- we bonded over both being artists, and Dr. McCall is more traditional and had watched me grow from birth. It was so cool to see how they both brought their personalities to the ceremony. First, J and I saw each other before. We would have never wanted it any other way. J still wanted the "reveal" so I arranged for him to meet me on the balcony of our wedding suite so we could have a moment or two before the whirlwind of the night started. My dad walked me to J, gave us some advice and then kissed us bye and went downstairs to wait with the rest of the wedding party. J's look blew me away. It was a mix of awe, happiness, disbelief, joy, and tears all rolled into one. I don't think I'll ever forget that. We took pictures, met with the party and took more pictures, and then went to the church and took even more pictures. Then we waited together (with the bridesmaids and groomsmen) in the library. So much fun. You could tell the coordinators at the church didn't like the guys and girls being together, but we did it anyways. I didn't get nervous until they separated us and had me and the girls waiting in the chapel. Then I started worrying about falling, tripping (which would then probably lead to falling) etc. etc. Next thing I knew we were lining up. 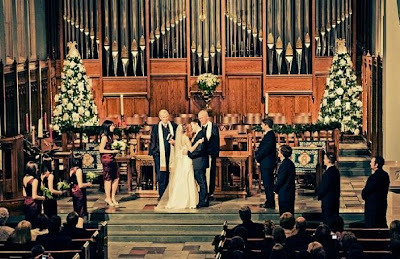 We had a "seasonal prelude" since we were married in December and that was a way to get around the no secular music rule of the church. We simply told our organist Brad to "just have fun. "Apparently he'd never had a couple do that before, which I think is unfortunate. I mean, we aren't the experts on organ music, why not let him do what he thinks is best? All I said was I loved Trans Siberian Orchestra and wanted some drama. If this could be incorporated in a weddingish way, we would be stoked. Next was the chiming of the hour (which the coordinator's tried to act like wasn't going to happen and attempted to send the bridal party down early. This was the only time I actually flipped out on someone. My apologies to the wedding ladies, but given that this same mistake ended in a bride walking down the aisle to no one (the groom was waiting like he was supposed to for the chiming of the hour) I didn't want to risk it. Then Brad played a tweaked (as in I wanted this, but we couldn't have secular music so we called it Pachelbel's) Canon in D for the processional. The girls walked in to the slower beginning and I walked in with my dad to the faster part. I really like the song and we all wanted everyone to hear as much of it as possible instead of a 5 second exerpt. My dad and I actually cried more walking down the aisle at the rehearsal than the wedding. I think we both knew if one of us started then the other would and then we'd never stop so for each others sake's we refrained and just joked- a lot. 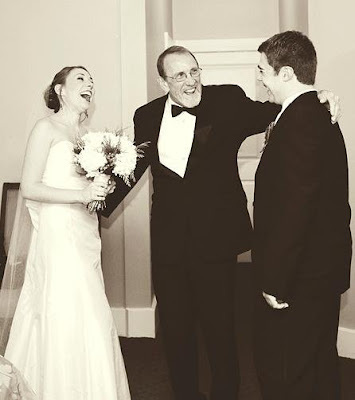 We didn't realize how long my dad would actually have to stand up there with us, but as Presbyterians we focus a lot on including everyone (i.e. the congregation) so he was there through the welcome, statement on the gift of marriage, prayer, first scripture readings, declaration of intent and affirmation of the family and friends. I could tell he was barely holding it together so throughout the entire beginning we thumb wrestled. Yep. I was thumb wrestling during the ceremony. My dad and I are such nerds. After all of that my dad got to sit down, which I think he was incredibly grateful for. More on the readings etc. We picked Ruth 1:16-17 first, but then were asked to choose a second reading as well. J and I both didn't want to use 1 Corinthians chapter 13. Not because it's not beautiful and true, but because it's so over used that people stop listening to what it's actually saying. Once you hear "love is patient, love is kind" most glaze over and wait for the next part. Well we still included it, (there are seriously only like 4 verses in the ENTIRE bible about marriage and love. Well unless you include Song of Solomon, but seriously? Passages about quivering thighs and beautiful breasts weren't going to be included in this ceremony:) )*** but just made sure to place emphasis on other parts so people could actually hear what it says. Then we have the Affirmation of the Family and Friends. Like I said earlier- we include everyone. Presbyterians are big believers in the saying "it takes a village to raise a child." J and I really loved this part though. First my dad is asked who gives me away** to which he says "her mother and I", but then the pastors proceed to ask if both families will love and support the marriage. Promising to encourage and protect it, and never to do anythign to hurt our bond. Then, they ask our family and friends who came to witness us getting married. It was so beautiful and meaningful to know that everyone there promised to support us as a team, to love us, and to protect our marriage. There's just so much love in that. Then we exchanged our vows (the same ones my parents recited) and exchanged our rings. I was doing so well with not crying. But the moment I had to say "in joy and sorrow" all of the love and happiness just overwhelmed me. I choked on my breath. I could feel the tears building up, and I had to take a second to collect myself. I was hoping people didn't notice (yea, right, everyone is looking at us) when Dr. McCall told me it was okay and just to take a minute. Apparently, that, along with my single tear caused the entire congregation to choke up as well. Ten we had another prayer, the announcement of our marriage and another scripture reading (Colossians 3: 12-17) which talks about no matter what, to always wear love. In the charge and benediction, Boyd took our hands, placed them in each others and then tied his stoll around them. He told a story about how his wife quilts and how in each quilt you take bits of different fabrics and sew them together to create something even more beautiful. He also said that a lot of quilters will purposely put a "flaw" into their work to mark it. He reminded us that now we must combine little parts of each other together, and not to be scared by the flaws and hardships for that is what makes our marriage unique. That our "quilt"- made by joining together- was only ours. That it would shelter us, protect us, and keep us comforted when we felt alone. It was absolutely beautiful. That advice ended the ceremony, we kissed each other and as Toccato from Organ Symphony 5 played we walked out as husband and wife. So long, I know, but if for no one else but me, I wanted to share our experience and remind everyone to remember the real reason for a wedding- to be married. Don't rush through the ceremony- embrace it, remember it and cherish it. This is where you become one- where you promise to love, nurture, protect and provide for one another- no matter what life throws your way. Happy Friday everyone!! Enjoy the weekend. * I say more perfect because I am a firm believer in the fact that regardless of the events of the day, as long as you end up married, it's perfect. ** I wasn't super keen on the giving away wording, and I really think that Boyd changed it to say who supports this marriage, but I can't exactly remember. *** Boyd told us about a bride who was insistent on having this- no matter how much he asked her to reconsider. He says he was so embarrassed having to read that out loud in front of her parents and grandparents.